Fischer’s anniversary celebration ... in Qatar. 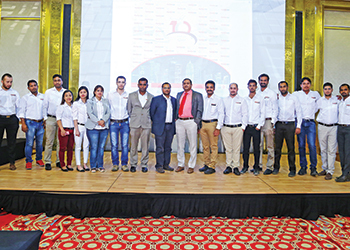 Marking a decade of service to the region, Fischer Middle East, along with its local partners and customers, organised events in Qatar and Oman to celebrate the milestone. Fischer Middle East is a subsidiary of Fischer group, a Germany-based company offering innovative fixing solutions. The company set up its regional operations in 2006 in Dubai, UAE. Over the past decade, the company has grown exponentially with local bases established across all the GCC states. Today it has a strong presence, not only in the UAE, but also in Qatar, Oman, Saudi Arabia, Kuwait and Bahrain. It has played a key role in major projects ranging from The Palm islands, Burj Al Arab and Mafraq Hospital in the UAE to Saudi Arabia’s Grand Mosque in Makkah, and the Qatar Islamic Tower office and the Qatar Petroleum District in Qatar, to name a few. “Our success in these projects can only be credited to the strong and versatile team of experts across our GCC operations,” said Jayanta Mukherjee, managing director of Fischer Middle East. “We not only offer technologically advanced products, but also work closely with the contractors, consultants and clients to come up with innovative and apt solutions to meet project requirements. Fischer’s anniversary celebration ... in Oman. “Currently, our solutions are becoming a reference for future projects and we will continue to work towards delivering great work,” he said. Mukherjee and a team of professionals hold credit for having launched Fischer’s regional subsidiary in Dubai. 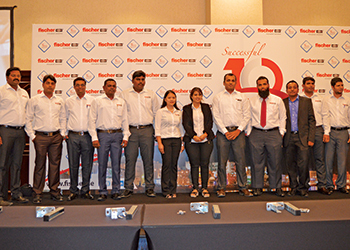 Late last year, Fischer opened its new office in Abu Dhabi, which is its third in the UAE and 10th in the Middle East region. This year, the company will launch its largest office and warehouse in the region in Jebel Ali, Dubai, in order to cater to its increasing business in the GCC. According to Mukherjee, business has grown so much that the German fixings and installation systems specialist needs to bring in many more products from its five factories located in five countries. The new facility coming up in Jebel Ali will include 8,000 sq ft of office and 22,600 sq ft of warehouse space. “We currently have our head office in Jebel Ali, but we need to expand; so we have taken up a massive space and we will move to the new facility this year. We see a lot of demand for our products in view of the Expo 2020 in Dubai, Abu Dhabi’s Vision 2030 and the 2022 Fifa World Cup Qatar. Once we move to our huge warehouse, we will have a larger reach into the market,” he added. The new facility will also include a training centre like the one it has in Germany. Fischer said it has drawn up a long and promising road map with major plans for the Middle East. Beyond this, Fischer said it is gearing up to explore new markets and capitalise on opportunities. The company said the versatility and completeness of its product range and solutions and its proactive approach in being involved in every stage of a project will be key in expanding its reach. This will also lead to acquiring new projects, despite the unstable market conditions, it said.